President Trump announced on Monday that he is proposing an increase of $54 BILLION to the United States’ military budget, which raises some serious questions about his plans for the future of U.S. foreign policy. “It will include a historic increase of defense spending to rebuild the deplete military of the United States of America at a time we most need it,” Trump said. What depleted military? 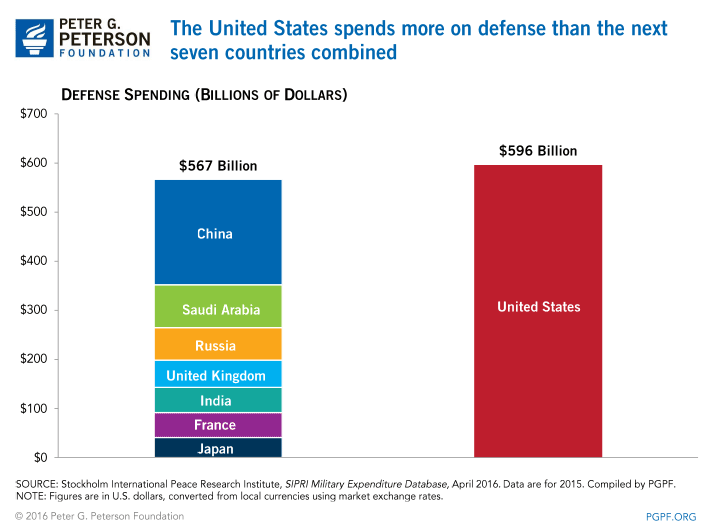 Not only does the United States spend more on its military than any other country in the world, it spends more than the next seven countries on the list… combined. “We must ensure that our courageous service men and women have the tools they need to deter war, and we called upon to fight in our name only do one thing: WIN. We have to win. We have to start winning wars again,” Trump said. We have to start winning wars again? Really? If you look at every foreign conflict the United States has been in during this century, they all come back to the same thing: the U.S. chose to overthrow the leader of a sovereign nation, and in doing so it acted as if there would be no blowback. The most important thing to remember here is that the best way to start winning wars is to stop creating them.